Excellent inlaid work jewellery boxes.size 2"×3". We are engaged in offering an extensive range of Stone Inlaid Jewellery Box which are made by using very superior and premium quality raw material. 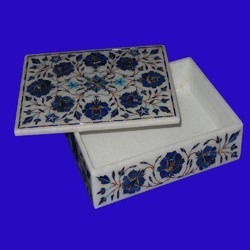 These Marble Jewellery Boxes are available in various shade and pattern. We offer these Boxes at most affordable as well as at market leading price. Traditional Indian handicrafts are famous all over the world for its brass inlay, bone inlay and beautiful carvings. 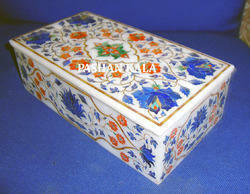 These beautiful jewellery boxes are Brass Inlaid Jewellery Box and are available in different sizes and styles. Made up of solid wood makes it classic item for any dressing room.